I just started my new job this week, and though I love every bit of it, I’m looking forward to a long, relaxing weekend. I usually spend my Saturdays and Sundays dining, shopping, and my all time favorite~dressing up. Over the weekends, I have the luxury of putting more thought into my outfit ensembles! This week, I’m planning on incorporating stripes into my wardrobe. I spotted a fair amount of stripes at various designer spring runway collections, and though some trends are better left on the runway, this one seemed pretty approachable. I tested out the trend with a cute, but structured striped dress. 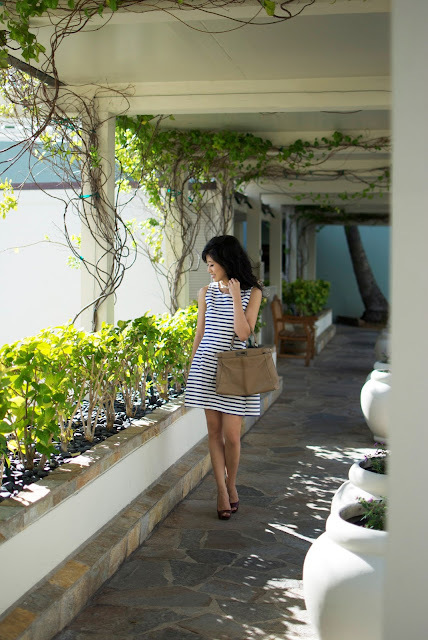 The tailored waistline and silhouette made horizontal stripes more flattering, while the clean palette gave my spring outfit a preppy sophisticated flair. I completed the outfit with my Fendi Peekaboo, Prada peep toes, and a glass of peach Bellini! Thanks for reading! Wishing everyone a wonderful Sunday! what a great, simple dress, I love the cut of it!